Titan and Bioforce are ideal for convenient and hidden filtration. 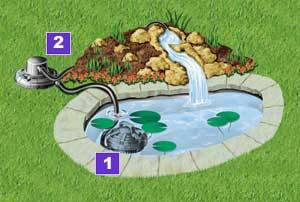 They are for people who want a filtration system which will not detract from the beauty of their pond design. Two products - The Bioforce UVC and the Titan Solids handling pump, will look after ponds up to 18,000 litres (4000 gallons), and form the basis of our new compact filtration philosophy. The range of specially developed Titan solids handling pumps, move polluting solids out of the pond into the filter where they can easily be removed. Due to the special open impeller and pump body design, large volumes of water can be moved without blocking the pump. This is a pressurised pond filter with integrated UVC. It is small and hidden in the ground. It is very easy to install, simple to maintain. The correctly sized filtration package will give our unique clearwater guarantee. For more information please visit our Filters and Pumps pages.